SAVORING DECISION: Judge ruled in favor of Wanda Johnson-Pope after mall owner tried to cancel lease. The owner of a popular ice cream shop in Carson won her battle Wednesday to hang on to the business she has run in a strip mall for more than 23 years. "It feels great," Wanda Johnson-Pope said Wednesday afternoon as she struggled to keep up with the orders of congratulatory customers queuing up at Ken's Ice Cream. "These people are here to be with me, to offer moral support," Johnson-Pope said. A Superior Court judge in Compton ruled that Johnson-Pope, 64, had a valid option to renew her lease at the strip mall for five years, and a jury decided Wednesday that she had properly exercised that option. "This is a victory for a business that has been a pillar of the local community," said her attorney, Michael Taitelman. Johnson-Pope's problems began last year, when the Summit Team, which manages the strip mall, sent her a letter saying that her lease would not be renewed. She said the letter gave no explanation, but Michael Israelsky, a Summit Team representative, told her the firm had signed a lease at the mall with a new Baskin-Robbins franchise and the lease included a "no competitors" clause. Israelsky said Wednesday that Summit had no choice, that it was simply honoring a commitment made by a previous management firm. 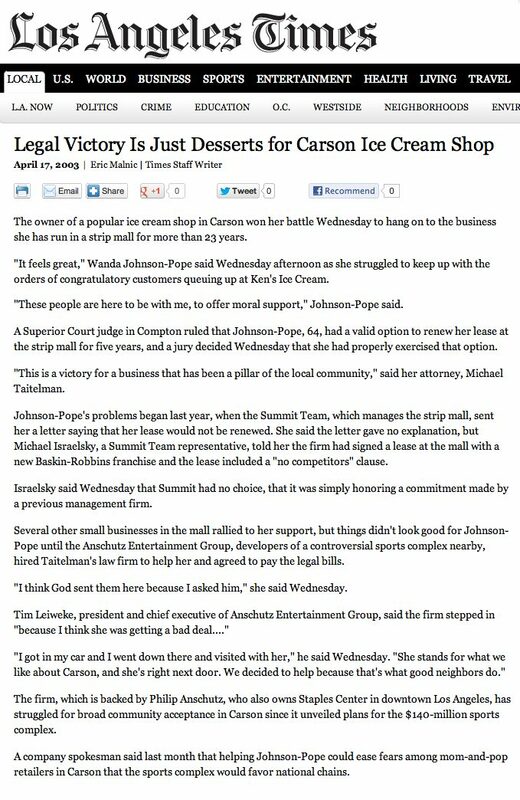 Several other small businesses in the mall rallied to her support, but things didn't look good for Johnson-Pope until the Anschutz Entertainment Group, developers of a controversial sports complex nearby, hired Taitelman's law firm to help her and agreed to pay the legal bills. "I think God sent them here because I asked him," she said Wednesday. Tim Lelweke, president and chief executive of Anschutz Entertainment Group, said the firm stepped in "because I think she was getting a bad deal..."
"I got in my car and I went down there and visited with her," he said Wednesday. "She stands for what we like about Carson, and she's right next door. We decided to help because that's what good neighbors do." The firm, which is backed by Philip Anschutz, who has owns Staples Center in downtown Los Angeles, has struggled for broad community acceptance in Carson since it unveiled plans for the $140-million sports complex. A company spokesman said last month that helping Johnson-Pope could ease fears among mom-and-pop retailers in Carson that the sports complex would favor national chains. Asked about Wednesday's court decision, Israelsky pointed out that, in sharing the mall with Baskin-Robbins, Johnson-Pope is competing with a nationally recognized firm. "I don't agree with the court's decision," Israelsky said. "But if she's able to survive there and do well, great."